Before getting on the plane to return to Rome, Cardinal Tarcisio Bertone said he "had expressed to the Cuban president his best wishes in successfully facing his mission at the service of the country." The cardinal also said he insisted on a particular "desire of the Holy See: To promote even more a growing closer between the world and Cuba, as well as the increase of convergences in important international questions." With "respect for the sovereignty of the country and its citizens," Cardinal Bertone said he had expressed to Castro "the Church's concern for prisoners and their families." After Pope John Paul II's trip to Cuba in 1998, authorities released a large number of inmates, including 99 held for political crimes. 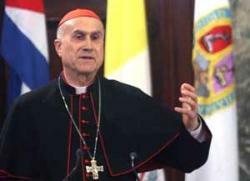 The official Cuban AIN agency reported after Cardinal Bertone's meeting with Castro that "both representatives had official conversations, in which the progress of the relations between the Cuban state and the Holy See and the Catholic Church in Cuba were examined. Moreover, they exchanged ideas about issues of multilateral and international interest." The Cuban foreign minister, Felipe Pérez Roque, defined the encounter as "cordial, respectful and sincere." Earlier, the cardinal told the Italian bishops' SIR news agency regarding the question of prisoners, "The Church does not impose, but proposes." He also told the agency that the island's leaders had assured him they would allow some Catholic broadcasts on state-controlled media. "Authorities have promised me more openness in the print press and the radio -- and in some exceptional cases, in television as well," he said. "We do hope for some openness, because nothing is impossible." Cardinal Bertone thus concluded his trip to Cuba, which marked the 10th anniversary of Pope John Paul II's visit to the island nation. During his six full days in the Caribbean, the cardinal visited four dioceses, celebrated several open-air Masses attended by thousands and unveiled a statue of John Paul II.